Suka has been around for more than 5 year already, quietly serving diners in One Residency serviced apartment in Kuala Lumpur. With a new management in tow, we visited the new Suka for a preview of what the restaurant & bar has to offer. It was an early Saturday evening when we head on over to Suka. The restaurant & bar has a good discreet spot in the building, nicely enclosed behind green scrubs so one doesn’t even think you are at a busy spot in the city. Walking into Suka is pretty relaxing at sight. It’s nicely spacious with its modern minimalist interior. Everything including furniture is kept relatively simple. The bar is modern too, located at the side of the restaurant facing the outside where it serves the purpose of serving the al fresco area as well as the inside. There is a pool table for customers to have some fun too. 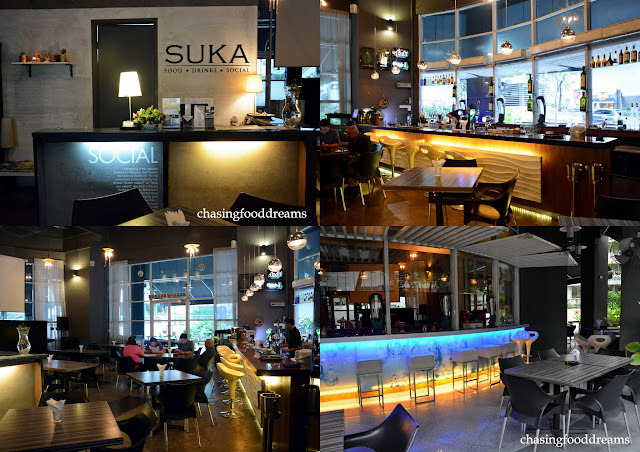 Suka has garnered quite a list of regular over the years and it’s a place perfect for some R&R moments and some bites. During the day, it caters to the office lunch crowd while the evening sets the mood for many who just enjoy hanging out to good bites and drinks. There is also a live band on Friday nights. Since it was Saturday, we decided to go the giggle juice route and ordered Mai Tai (RM22), Mojito (RM22) and Long Island Iced Tea (RM22). The cocktails certainly liven up our evening as we look forward to some bites from its fusion menu of East meets West. From the salad section, we had their Smoked Duck Breast with Mango Grapes Salsa (RM21) and Orange Mango Mint Salad (RM20). Warm slices of duck breast is accompanied by a fruity mango grape salsa with a side of greens. The dish makes a nice starter as the duck was delicious and moist. The rich notes of the duck is nicely lighten with the fruity salsa. The Orange Mango Mint Salad is a healthy salad with invigorating flavours of creamy and tangy yoghurt dressing with mint. I was pleased with the Pasta Vongole (RM25.90), a classic rendition of pasta and clams in garlic sauce. At Suka, chili padi are added to spice up the pasta. It’s light and delicious with lots of spicy garlicky notes. For those who prefer to go meatless, opting for Pasta Pesto with Wild Mushrooms (RM25.90) is a good choice. It’s a hearty dish of pasta tossed in herb and cheese pesto sauce together with mushrooms, tomatoes, carrot, broccoli and cauliflower. The pasta is nicely flavoured with a hint of sweetness. We had quite a few lamb dishes at Suka and the Rack of Lamb (RM45) was my favorite of the lot. It’s nothing new but it is cooked well till medium and moist. The lamb and the black pepper sauce are tasty and rich so I enjoyed this with the mashed potatoes and vegetables. Chicken Veldostana (RM39) reminded me of Chicken Cordon Bleu except this one is healthier as it is baked with ham and cheese. We opted for a choice of Black pepper sauce over mushroom. Served with mashed potatoes and vegetables, its comfort food with a healthier option. The chicken is very moist and tender while the cheesy notes are always much welcome in my books. Smoked Duck & Peach Pizza (RM30) is another good combination on pizzas. The dark smoky duck flavours is balanced nicely with the sweet soft peaches, tomato sauce and cheese. It’s a nice thin and crusty pizza base with a very scrumptious filling. Must-order! From the Tapas menu, we had the Char Grilled Lamb (RM29.90) and Lamb Varuval (RM25.90). Both lamb cuts were a bit tough so I didn’t enjoy the texture but the flavours for both are good. The Char Grilled Lamb has got good char grill aroma and is flavourful from the marinade and mint sauce. The Lamb Varuval is very spicy in terms of heat and robust as well. It is rich and perfect with the toasted garlic bread. Although I can take a good dose of heat, this one is pretty lethal. There is a side bowl of raita to cool down the heat level for those who can’t take the heat. Suka also has a local menu to cater to diners. We tried their Pineapple Fried Rice (RM20.90) and found it decent. The nice curry aroma and flavour goes well with the pineapples and seafood. There is not much dessert in the menu but we did finished with a simple Peach Melba (RM12.90) of vanilla ice cream with peaches.